No deal has been reached between the Israeli authorities and Palestinian prisoner Khader Adnan who, on Saturday, entered his 54th day on hunger strike, his lawyer said. 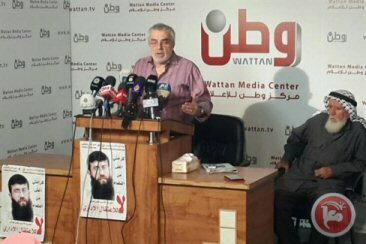 '(Israel) is seeking to end Adnan’s hunger strike in a way that avoids them a feeling of crushing defeat,’ the Palestinian Prisoners’ Society’s chief lawyer Jawad Bolous said, at a press conference in Ramallah, on Saturday. Ma’an News Agency further reports that Adnan, 37, began his hunger strike nearly two months ago to protest the Israeli practice of administrative detention, under which Palestinians can be held without charge or trials for months or years. He has said he will continue his strike until Israel agrees either to release him or bring charges against him. It is the second time Adnan has gone on hunger strike against the practice, following a 66-day long hunger strike he undertook in 2012 — the longest carried out by a Palestinian in Israeli detention. Bolous said that the Israeli hospital in which Adnan is being held notified him late Friday that Adnan’s health had further deteriorated. ‘The hospital was on alert and they prepared for resuscitation,’ he said. The Islamic Jihad movement — with which Adnan is affiliated — said Friday that if Adnan dies in Israeli detention, the ceasefire agreement that ended last summer’s devastating war in Gaza would be at stake. Adnan was detained in July last year and sentenced to administrative detention for the 10th time in his life. In addition to protesting administrative detention in general, he also wrote in an open letter last month that he hoped his strike would prevent Israel from tarnishing the achievement of prisoners who secured their freedom by going on hunger strikes in the past, only to be rearrested by military forces. In 2012, he agreed to end his hunger strike along with 2,000 Palestinian prisoners who had joined his strike after Israel agreed to lessen the practice of administrative detention and improve prison conditions. Despite Israel’s agreement, around 500 Palestinians are currently being held under administrative detention among a total of nearly 6,000 Palestinians in Israeli prisons.